How did you become a professional artist? About 12-13 years ago, as our last child showed signs of leaving the nest, I started contemplating what I wanted to do with my life since I was facing unemployment as a mother. 30+ years ago when I was in college, my major was art. I dabbled a bit here and there while raising my kids but nothing resembling dedicated study and practice. I was extremely rusty but there was a spark that was fuelled each time I tried drawing something and soon the passion I felt long ago ignited. I began with fan art, mostly LOTR since the movies were all the rage. I entered a few online contests and won a few awards. I began taking classes, as many as I could afford. I just kept at it and started getting jobs. Those jobs led to others. I remember one day I ran into an old acquaintance and when she asked what I did, I blurted out, “I’m an artist”. This declaration resonated within and from that moment on, each artistic endeavour took on new meaning for me. I read another interview with you a few years back in which to a question you wrote “I can’t remember my life without associating some type of art/creating with it. I was always drawing as a kid. Throughout my schooling, art and music were my passions. There are so many parallels between the two. I did have a defining experience a decade ago when I needed to choose where to focus my energy. Art won out and I’ve never looked back.” I was wondering if you would tell us about this experience? The experience I referred to in the interview involved a difficult audition process for a well-known choir. I made it through all the tests and call backs and was waiting for the acceptance/rejection letter. In the meantime I had been paid for my very first freelance job and wondering if I would be able to funnel the energy for both endeavors. The morning the letter arrived I had this powerful impression that I did not make the singing group but had the overwhelming sense of peace that art was the direction to go. In so many ways this experience clarified my decision. The difficult aspects of returning to an art career involve time, balancing family and age issues…which lead me to your next question. What challenges did you find the most difficult during this process? My biggest handicap is the mental perception of age… that it’s too late to try or to start. Oh, those age demons play havoc with my confidence. It’s hard to walk into a classroom and realize you are old enough to be the teacher’s mother, let alone the other students. I’ve had to overcome my fear of learning the computer and Photoshop and networking. Promoting my work is almost painful but it’s necessary. These factors as well as my shortcomings in technique and anatomy are my biggest challenges. Oh the art! The challenge of creating something that’s in your mind and succeeding. I love connecting with other like-minded souls and finding inspiration in their work which drives me to work harder. What is your drawing Achilles’ heel? Is there something in particular that stumps you? Hey, do you have an hour or two? If I were to pick the biggest problem it would be my lack of confidence. It’s okay to be grateful and humble about your craft but there is a point where second guessing your work can shackle you and sabotage your dreams. It’s the artist’s curse that we are rarely satisfied with the end result of our creative vision but constantly berating yourself is dangerous to the creative process. It’s a battle I wage daily. 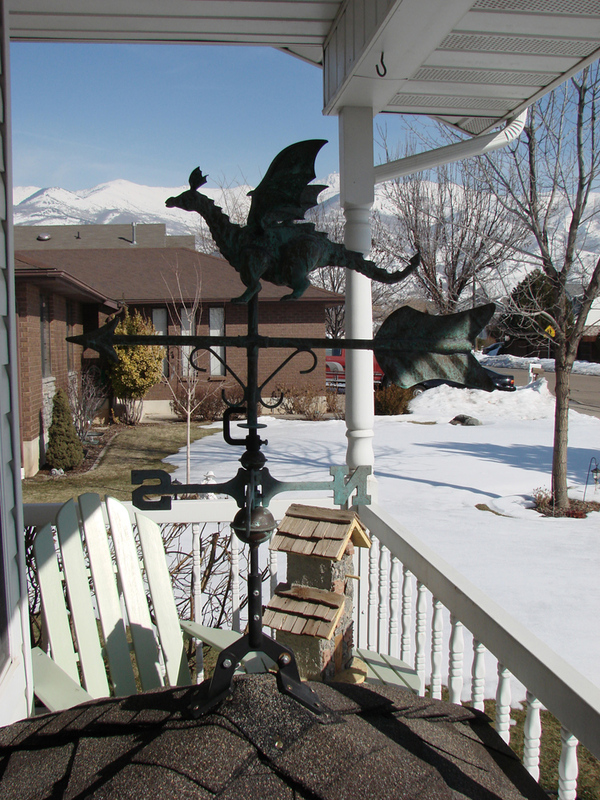 I read on your blog that you have a dragon weathervane at home! I’m jealous! 😀 How did you acquire it? I really do have a dragon weathervane. I found it online and several years ago my husband paid a neighbour to build a lovely cupola to hold it. There’s also a drawing of it on your blog header, which is called The Twirling Dragon. Do you consider yourself a dragon fan? Or was there maybe another reason you decided on this name? I am a huge dragon fan, especially when they have a bond with a human or human like individual (as in Eragon or Naomi Novik’s Temeraire series). I have loved animals all my life, especially reptiles and birds. I also spent the first 16 years of my life riding and showing horses. So, you put those three living species together and then stir in my fascination with dinosaurs and you have dragons. As far as the Twirling Dragon Header on my blog goes, my studio used to be underneath the roof that held the dragon weathervane and I could hear it squeaking while it twirled during blustery days. I’m now in a larger room in the basement that has a lock on the door to keep little grandchildren out and safe from potentially dangerous materials. Alas, I can no longer hear my dragon twirling. Who are some of your favourite fantasy authors? Oh boy, this is tough. Tolkien would have to be first on this list. Lord of the Rings is a deeply spiritual book for me and I can’t separate my return to art from discovering his work for the first time. Lloyd Alexander for his Prydain Chronicles holds such fond memories for me and my kids. Of course, Mark Lawrence, Brandon Sanderson, Patrick Rothfuss, and Maggie Stiefvater, Jonathan Stroud, Terry Pratchett, Suzanne Collins and well, the list goes on and on. Oh, and I’m really enjoying Robin Hobb. I’ve already mentioned LOTR and Prydain. Name of the Wind had me with the first two pages. The Scorpio Races by Maggie Stiefvater (sea horses! ), The Harry Potter series(sigh), Hunger Games, The Monstromologist by Rick Yancy and Mark Lawrence’s Broken Empire trilogy, pretty much anything by Sanderson but especially his Mistborn series and the ambitious Stormlight Archives. Loved Melina Marchetta’s Lumetere Chronicles. Anything Discworld, especially Tiffany Aching by Pratchett and Nation. I could go on and on but will finish with Orson S. Card’s Speaker for the Dead. I’ve seen a lot of excellent fantasy fan art that you created in the past. Which ones were your favourites? 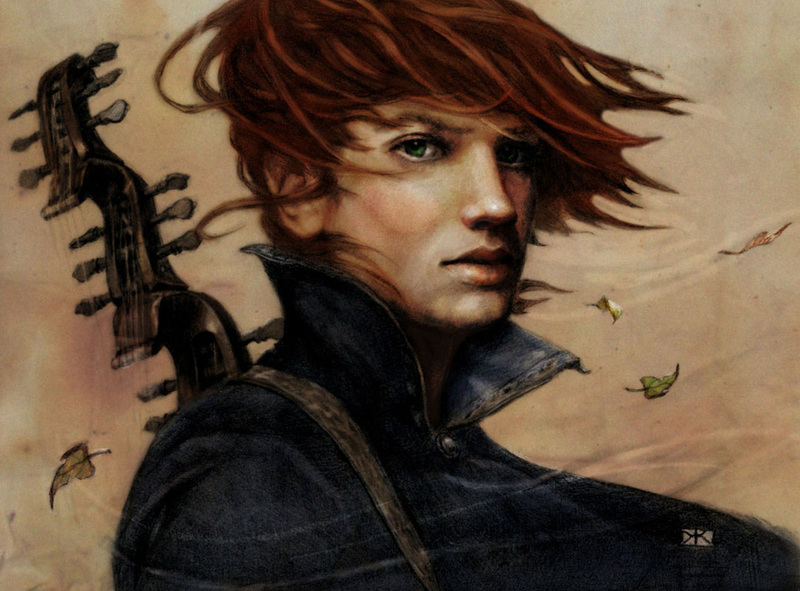 Kvothe (name: The Minstrel) is certainly my most well known. He was my first try at digital painting and he turned out better than I hoped. Probably my personal favourite is the one depicting the end of Arwen’s life from LOTR. I put my heart into her creation. 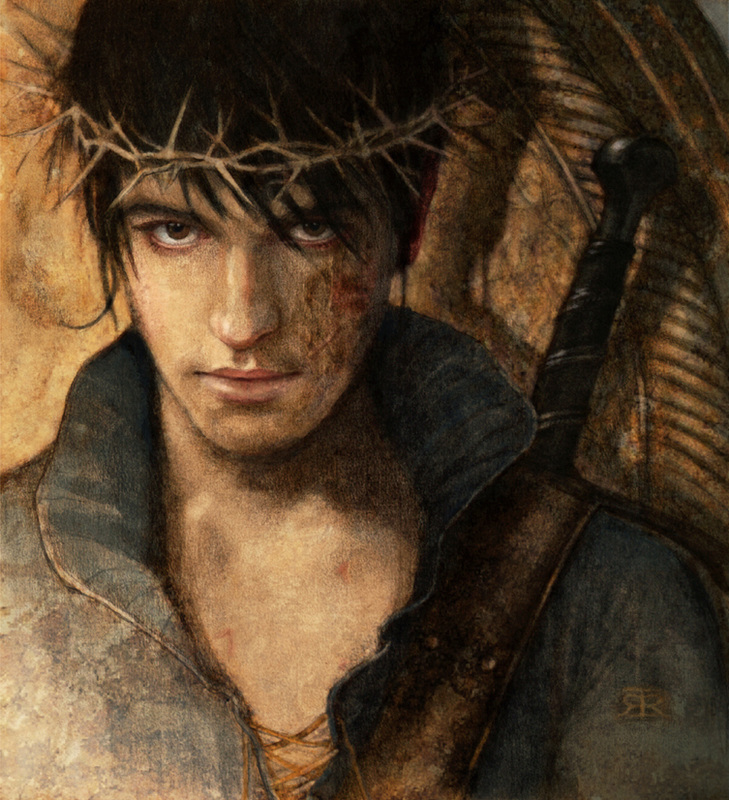 I believe I can speak for all Mark Lawrence fans when I say we loved your Jorg Ancrath art! He must have been a very challenging character to capture! Truthfully, I would like to do him over. I didn’t have much time but after reading Mark’s books I had to try to depict Jorg, who can be quite insistent as you know. 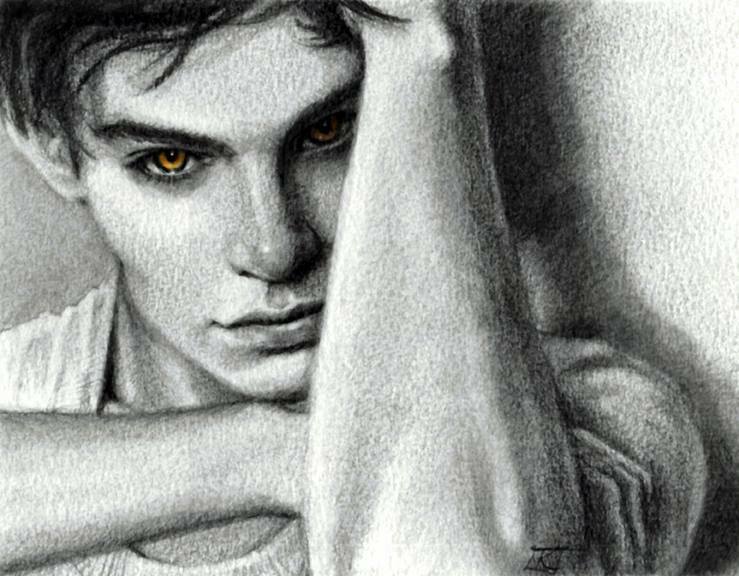 I personally also really liked your Edward Cullen fan art (based on the books rather than the movies), ‘Dazed and Confused’, capturing the moment when Edward realizes for the first time that he can’t read Bella’s mind, and I’m not even a Twilight fan! Oh Agnes, you are going way back to my beginnings. I discovered Meyer’s first book way before anyone was making noise about it. I worked at our local library to pay for my art classes and the Twilight audio book came through processing and I brought it home out of curiosity. I had no idea it was about vampires. Ha! I seriously thought Edward was an alien at first. How do you generally go about drawing fan art? When I respond to a character in a book, I try to envision their appearance. I will spend time on Pinterest or come across a random photo that jump-starts the drawing. From there, I start making tweaks here and there based on my impressions of the character. Sometimes people respond to the end result and sometimes they don’t. 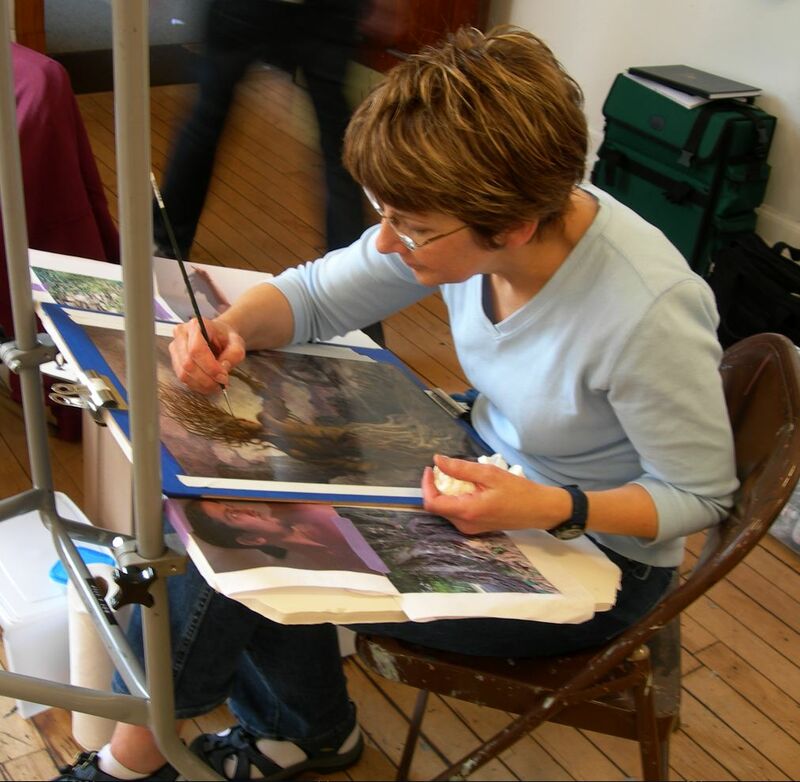 I used to love Boris Valejjo’s art as a teenager, and when I looked up some posts on your blog the other day I spotted a master illustration class photo of him, Donato Giancola, Julie Bell and other known artists. How did you find learning from them? 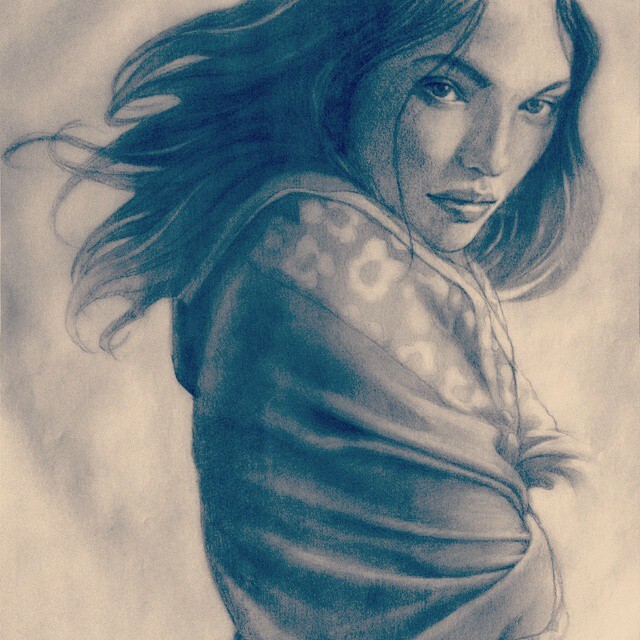 Attending the Illustration Master Class back in Amherst, MA was a game changer for me. 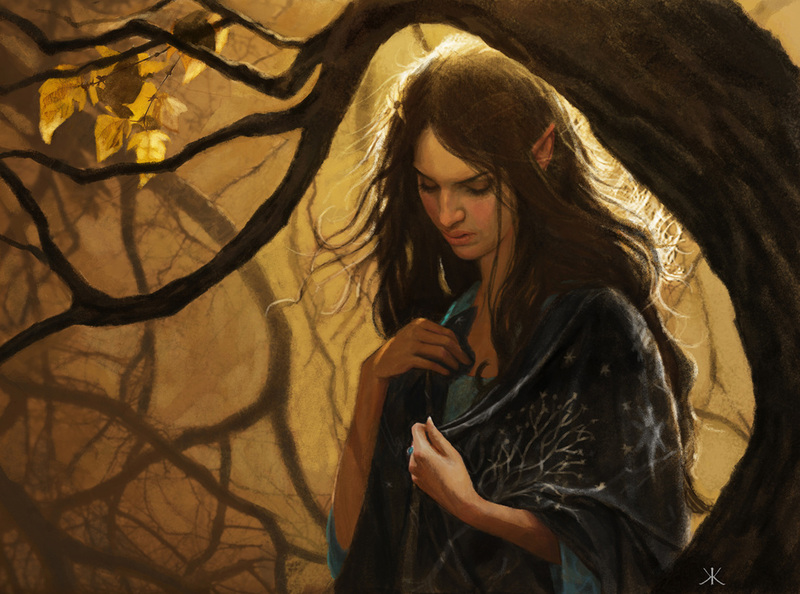 Rebecca Guay is the organizer of the event that offers an intense week-long immersion of classes, lectures and one on one instruction with the greats in the fantasy art genre. All of the teachers are so forth coming with their knowledge and process. Boris and Julie are such gentle, sensitive and generous people. Donato is amazing and so passionate about art and of course has a deep love of LOTR. What I have learned most from all these wonderful artists is that talent only takes you so far. It’s hard work and proper practice and persistently striving to improve that will bring about success. 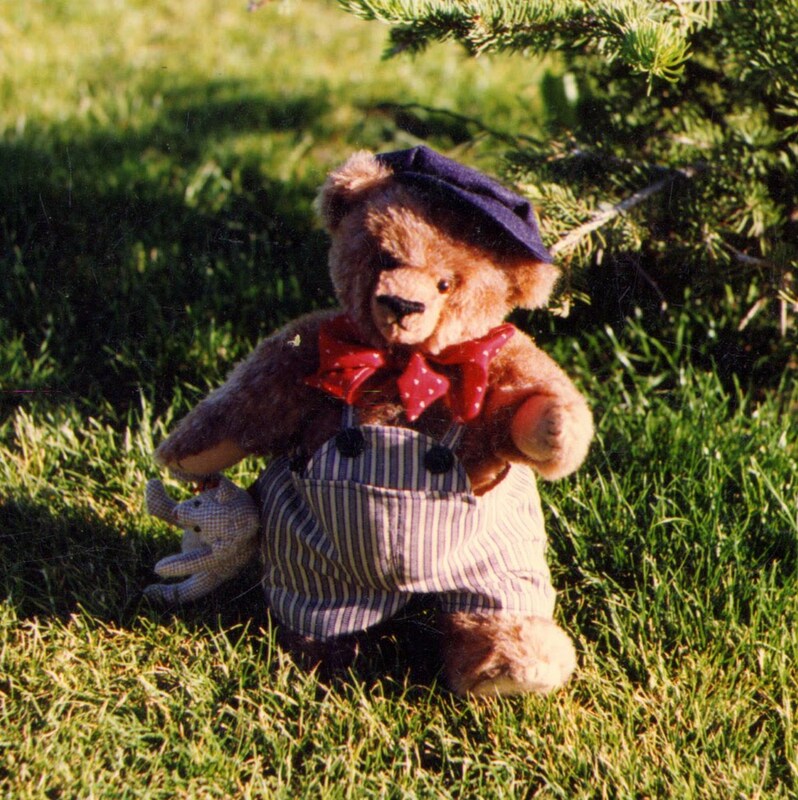 There was a time you used to design and sew dolls and bears. I really love this one here, for example. Do you think you might make some more of these in the future? No. I sewed for 14 years and was so burned out in the end. I have all these original patterns just waiting to be used but I’m not inspired to pick it up again. Maybe one of my kids or grandkids will use them and build a business with them. These days I often see you posting ‘Every Day Original’ arts. What is ‘Every Day Original’? Every Day Original is an online gallery developed by Marc Scheff and Lauren Panepinto. Over a year ago, they hand selected around 30 artists to post a small original work valued under $500 on a specific day of the month. It’s a great idea, providing small, affordable works for the beginning collectors well as a format for artists new to the gallery world. I’ve done it for over a year now and it’s been a good challenge for me to come up with something new every month. 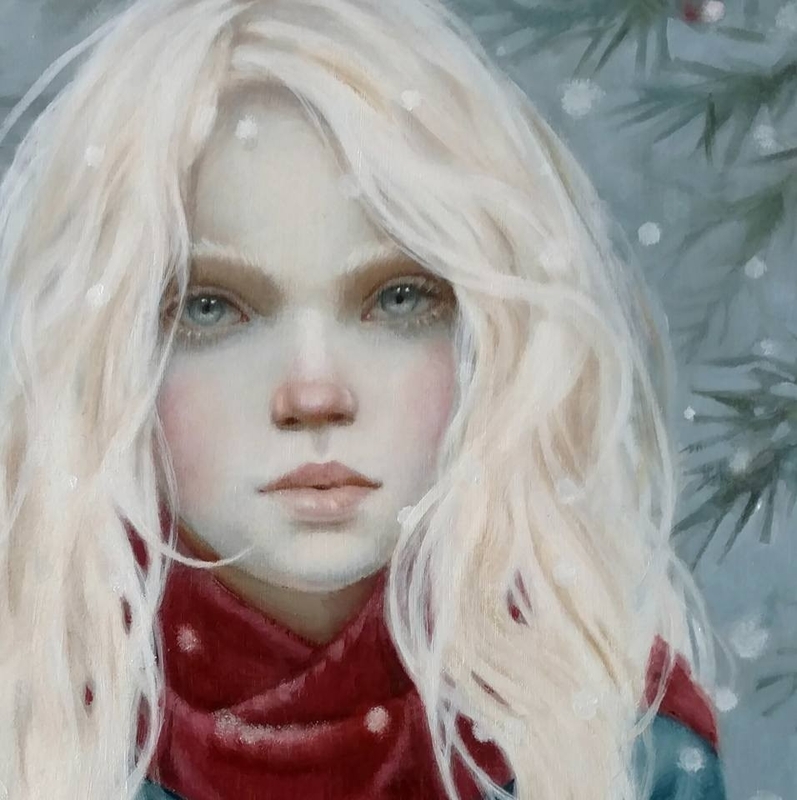 I just finished a piece (Snow Child) for an exhibit in Seattle in April. Each artist invited picked a personally significant book and created a mock book cover. The roster of artists is quite intimidating and includes both Julie Bell and Boris. I’m also finishing illustrations for a self-published children’s book and have three private commissions and an entry for an exhibit in New York in June at the Society of Illustrators. Is there any advice you would share with the contestants? Risk…take it. You’ll never know unless you try. Oh I absolutely LOVE that Kvothe illustration! I’m such a huge fan, Kimberly!! Thank you so much Dustin! How could anyone not love Kvothe, agreed? What a great interview! I also love that Kvothe picture. Visiting this page is ALWAYS a pleasure! Incidentally, I’m currently reading “The Name of The Wind.. I was on HAM radio today visiting with a neighbor, who said he was coming back from a funeral. I asked him who the funeral was for (wondering if it was anybody I knew), and he said it was a friend’s mother, named Kim Garfield. He mentioned she was from the Kincaid family and was an artist, and my heart sank. He said there was some medical procedure she was doing that went bad, and she slipped away suddenly. The funeral was today (May 3, 2016) and he said it was lovely and very memorable. If this is the same artist, my condolences to the family and friends of a wonderful artist and person. Thank you for your comment, Todd. It is the same person, unfortunately, her sudden death came as a big shock to many of us.